Part of the purchases on Sunday at The Fresh Market were these two items. I bought the licorice because I have a World of Warcraft friend, Amber, who lives in Australia. It's not a healthy supper by any stretch of the imagination but I was so tired that I decided this was it; fast, with sugar for energy. It didn't work. I was still way tired. I think it's coming down from the adrenalin rushes of the past month. But here are my impressions of these. The licorice. First of all, they don't spell "licorice" correctly. (snicker) Second, it was not at all like the licorice I'm used to here. The first thing I noticed was the instant smell of strawberries. 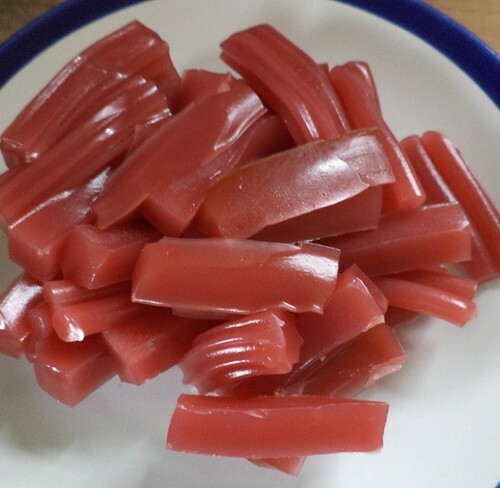 My typical strawberry licorice doesn't emit an odor you can detect when you open the package. I smelled strawberries. In fact, it was more strawberry than the organic strawberries I have in the fridge. Second, this was almost like fruit "leather". If you don't know what that is, it's pureed fruit, spread out and dried, then cut into strips. It's reasonably easy to make at home and is a great way to use up excess fruit when it's in season. You can control the amount of sugar and other additives. There's no high fructose corn syrup in this licorice, but the other ingredients were similar to what I've seen on American licorice packages. The taste was superb. It was easy eating. The pieces actually melted in the mouth and the strawberry taste was through the entire piece. 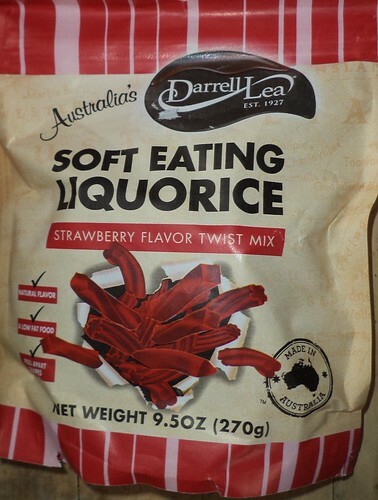 It could become my new favorite strawberry licorice if it wasn't so expensive. Now for the root beer. 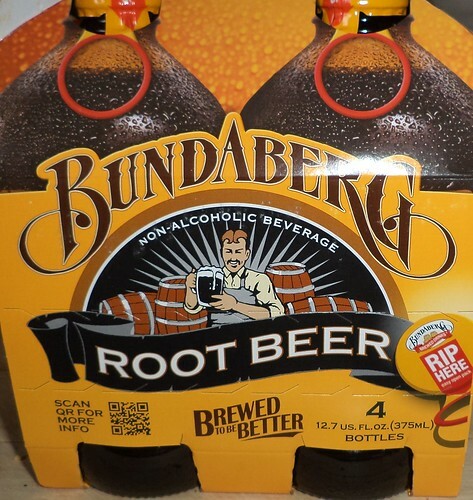 This was interesting because I didn't buy the beverage because it was made in Australia. I bought it because it was cheaper than similar beverages and I wanted some soda. (It was very interesting to me that this store carried Coca-Cola but no other mainstream soda and nothing else from Coke's extensive product line. There was no Sprite or root beer, just Coke.) 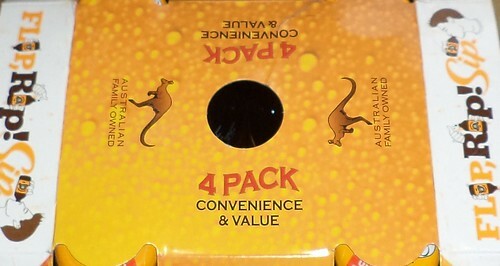 After I got it home, I realized it was Australian. The first thing I noticed was the pop top. 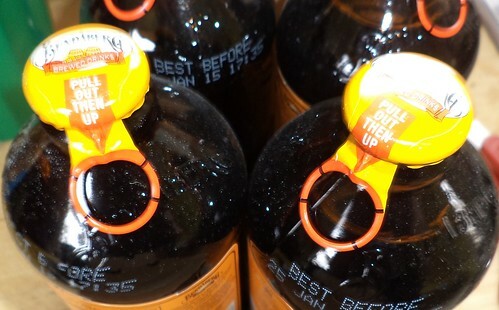 The pop top itself dates from 1959. It was invented by a guy who struggled with opening a bottle of soda one handed. When he invented the pop top, sales of beverages in aluminum cans skyrocketed and gave us one of the best songs ever. Cut my heel had to cruise on back home." From that humble invention, which lent itself to so many projects and cut heels, we moved to the pop top that doesn't leave the can without major effort. I'd never seen this kind of opening device before. As the tab says, you pull up, peel back the aluminum and underneath is a plastic ring that pops open with an audible pop. I don't get around much so perhaps these are on beverages in the US, but this was new to me. 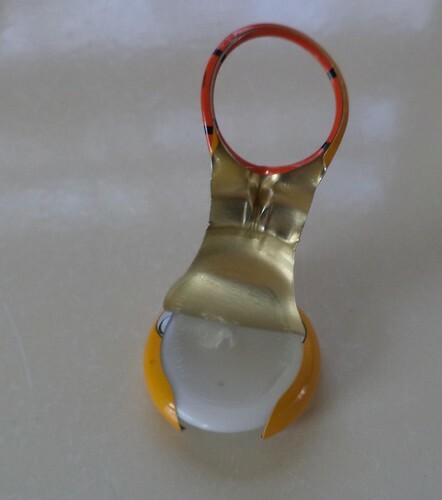 It opened easily, even for someone with arthritis, but was a complete seal. How did this taste? Well, first of all, I was surprised this was from Australia. In 1996, we made our last visit to England to see my late pen-pal and her family. We took with us a can of A&W Root Beer because we'd read that root beer is not found in the UK. We chilled the can for 24 hours and then sat around the table giving them a sample. They were not impressed. "How can you drink this stuff!?" was the consensus. It's a matter of what you've grown up with. "Root beer" is an American creation born of the desire to have something to drink but not having familiar ingredients at ready disposal. Recipes abound on the Internet for making your own root beer. (Note: I have not tried the recipe linked. I merely linked it so you can see the ingredients used for root beer made with roots. Some recipes use a "root beer extract" and not the actual roots. This article explains which roots actually go into the drink.) The ingredients are not found in England. Settlers made do as people will and created a uniquely American drink. To have something like this from Australia was going to be an experience. It's not sweet. I have to admit I was expecting the taste of current American root beer and this was not. The initial taste was bitter. I thought, "Crap. I'm going to have to pour out all 4 bottles. This is not what I was expecting." It wasn't, but several sips later and I realized I was tasting root beer as it used to be, before the advent of high fructose corn syrup. Sugar based root beer always had a slightly bitter taste to it, that was something of the appeal. That's why it held up so well in root beer floats. The bitter complimented the sweet of the ice cream. The more I drank, the better this became. I tend not to drink things immediately. A mug of tea will last me a couple hours and I'm drinking room temperature tea by the time I get to the bottom. The same is true of soda. Even on a hot day, which is just right for an ice cold Dr Pepper, I won't drink the whole thing at once. This root beer is best when it is cold. At room temperature, it's more bitter and less blended in flavors. It was still good, but less so than it is cold. I don't have any vanilla ice cream, but I'm considering getting some to try it in a float. This brought back memories of family picnics, summer night spent sitting on the front porch stargazing, hot August days where the air just didn't move, fireworks and the sound of Minnesota Twins baseball games on the TV. It hearkens back to a different era for me. It's too bad these are so expensive, but then, it's probably good they are. I'm not inclined to have them always in the house.